Monogrammed Christmas handkerchief embroidered with silver snowflakes and a name or initials of your choice and comes a silver snowflakes organza gift bag. Select from a Mens or Ladies size white cotton handkerchief. (If this gift is for a child the ladies size hanky is the same size as a kids hanky). 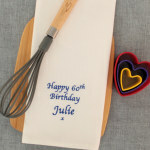 Fill in the options box with a name and choose a letter font style and what colour embroidery thread you would like the name personalised in. The snowflakes are embroidered in grey/silver thread around the name. 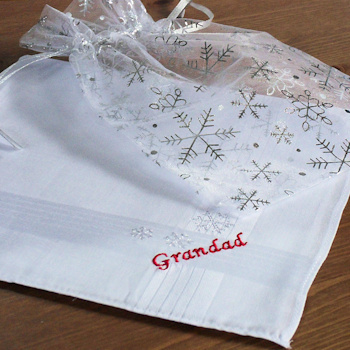 Comes in a sheer organza gift bag that has silver snowflakes decoration on it for presentation.